The body of work that Roni Horn has been meticulously building for more than 30 years encompasses drawing, photography, and sculpture. The artist calls into question the nature of perception and identity, of sameness and difference, through formal inventions of pairing and doubling. Experiential in nature, her works involve a subtle comparison of pairs of very similar images, creating situations in which viewers become aware, by the very movement of their body through space, of the fundamentally fleeting and contingent nature of everything. 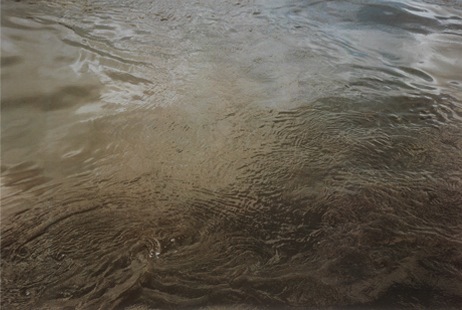 The metaphor of water in Some Thames (2000), which presents multiple views of the surface of the River Thames, and thus the change in appearance of a single body from moment to moment, is exemplary of this exploration. Born in 1955 in New York, Roni Horn lives and works in New York. Her art practice is divided among photography, drawing, and sculpture. She is principally interested in notions of presence and identity, which she conveys by engaging viewers in physical shifts and subtle comparisons. Her works have been presented at and collected by important institutions throughout the world. In 2009–2010, Roni Horn aka Roni Horn, a major retrospective exhibition, was organized jointly and presented by the Tate Modern in London and the Whitney Museum of American Art in New York, then by the Lambert Collection in Avignon and the Institute of Contemporary Art in Boston. Horn is represented by Hauser & Wirth.